American Guard Jihad Wright (193-G) had a very impressive game in the last round for top-ranked San Pedro T., receiving a Interperformances Player of the Week award for round 5. The player had a double-double of 22 points and 11 rebounds, while his team edged out Dream Ballers (#4, 2-1) 85-81. The game was between two of the league's top four teams. It allowed San Pedro T. to consolidate first place in the Belizean NEBL. They maintain a perfect record without any lost game in the league. The season is still on an early stage, but San Pedro T. already had a very good start winning all 5 without losing a single one. Wright just recently signed at San Pedro T., being already a very valuable addition to the team. Former University of North Carolina at Pembroke star has very solid stats this year. Wright is in league's top in points (6th best: 17.0ppg), assists (3rd best: 4.7apg) and averages impressive 1.3bpg,3.7spg and 52.9% FGP. 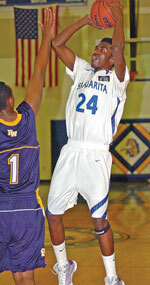 The second best player in last round's games was -year old American Luther Page (198-F) of Belmopan B.. Page had a very good evening with a double-double of 25 points and 12 rebounds. Of course Belmopan B. cruised to a 82-73 relatively comfortable win over Orange Walk RR (#6, 0-4). Belmopan B. 's 5th position in the standings has not changed. His team is not often considered as one of the league's best with a mere 2-3 record. Page is one of the most experienced players at Belmopan B. and has a reputation of one of team's most reliable players. He belongs to the best scorers in the league with 23.3ppg (#1). He also registered 11.7 boards per game. 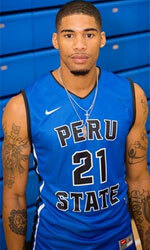 Third on the list of top players last round was American forward Nigel Jones (200-F-90) of Belize City D. (#3). Jones scored 19 points and grabbed eleven rebounds (!!!). 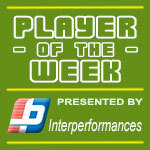 He was a key player of Belize City D., leading his team to a 73-61 win against Verdes (#7, 0-4). Belize City D. needs these victories very badly if they think about getting closer to top teams. Their record at this point is 2 victories and 1 lost games. Jones has a great season in Belize. After only 3 games, he made it on the list of the league's leaders in points with 22.3ppg (2nd best) and rebounds with 10.3rpg (3rd best). Jones attended one of camps at Eurobasket Summer League on his way to pro basketball.